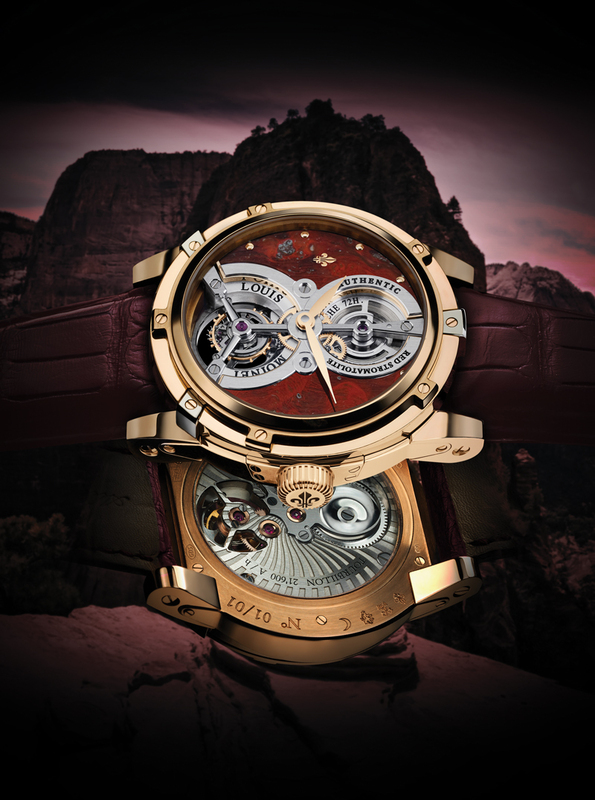 Consider, then, the Louis Moinet Vertalis Tourbillon “Red Stromatolite.” Louis Moinet is a rather particular kind of horological concern, with a rather distinctive perspective. The watches made by CEO Jean-Marie Schaller’s small company are not intended to be so much forays into bleeding-edge horological innovation, nor extroverted announcements of endorsements of sportsmanship or membership in that fortunate demographic dubbed the “One Percent” by disgruntled protesters, but rather essays in stone, steel, brass and rare minerals (with a little leather thrown in to hold them on your wrist) on nostalgia, and the pleasant melancholy that accompanies the knowledge that the work of human hands and minds can outstay in its beauty the individual hand and mind that made it. corrosive and dangerous gas called oxygen — existed on our world, the blue-green unicellular organisms known as cyanobacteria gathered together in their microscopic metropolises and formed colonies, growing into layered mats that accumulated on the sunward-facing surfaces of rocks in the shallow pools that laid across the shores of the infant earth. Today, stromatolites still exist on earth, but in vanishingly small numbers compared to their heyday. They were, once upon a very long time ago — some three billion years, a stretch of time so enormously vast that all of human history dwindles into an insignificant footnote to their immensely protracted history — masters of this world. They are now found still mutely huddling on mushroom-shaped rocks here and there in suitably out-of-the-way salty shallows, and to look on them is to hear a voice whispering from across the deeps of time, “Consider Phlebas, who was once handsome and tall as you.” And in the rich tradition of timepieces as memento mori (Mary, Queen of Scots carried one such watch, in the shape of a skull), master craftsman and expert lapidary Daniel Haas has taken a whisper-thin sliver of the remnants of some of earth’s first living things and placed them on the dial of a watch. No, it is not a cutting-edge technical tour de force, nor is it a lavish pronouncement of one’s affluence. But it is a sensitively and smartly done meditation on time and the nature of its presence in the human mind, and a reminder to not sweat the small stuff. And also, of course, that taken from a wider perspective, it’s all small stuff.